Successfully Added Weatherproof Rough Service Cellphone - Unlocked Mobilephone (EU) to your Shopping Cart. Weatherproof rough service cellphone for use in any outdoor environment. 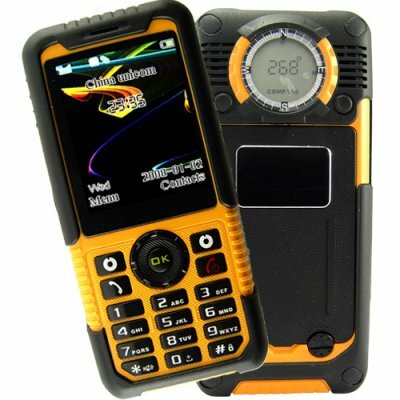 This ultra durable dual-band (900MHz, 1800MHz) GSM cell phone features an internal hardened magnesium frame and 3.5mm rubberized casing, providing the ultimate in real world durability - whether that means using it as your mobile handset in the city, on the construction site or climbing Mount Kilimanjaro. This rugged mobile phone has a set of outdoor tools that includes a flashlight, laser pointer, magnetic compass, barometer / altimeter, thermometer, and FM radio. This is all neatly integrated into a high visibility yellow/black color casing with rubberized shell that repels dust, water and snow. Not to mention that the metal magnesium frame means you can drop and step on the M12 all day long without hurting it! This is one mobile handset thats a good choice for both the adventurer as well as the clumsy relative. This is a perfect mobilephone for the internet storefront re-seller that wants to offer his customers something new, unique and useful. This model is available to you at a low wholesale price from the leader in no M.O.Q. (no minimum order quantity) direct from China electronics, Chinavasion. This is a all-environment rough service GSM cell phone. Includes tools that are useful for both on the work site or during your most extreme days of adventure. This is an unlocked cell phone; feel free to use it with your favorite network provider.